In this photo from left are Madison Scarberry with her hair up in curlers, and Kali Davis wearing a robe in the middle of the day and bearing 100-year-old creases in her forehead. Tuesday was the 100th day of school for these girls, and they came to Holmes Elementary as 100-year-olds. They are pictured as they count out 10 pieces each of 10 different kinds of snack items, adding up to 100 pieces total. Hey, why not splurge now and then when you’re 100? 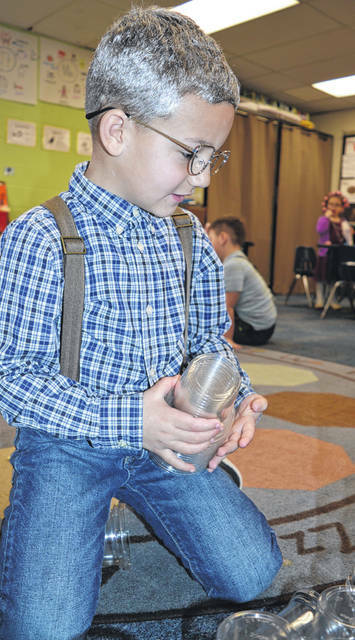 Suspenders and silver-gray hair make kindergartner Bensen Harpen look many years his senior Tuesday as he celebrates the Big 100 Days of School milestone. He’s placing cups in a formation that he hopes will stay up and add up to 100 cups when he’s done. 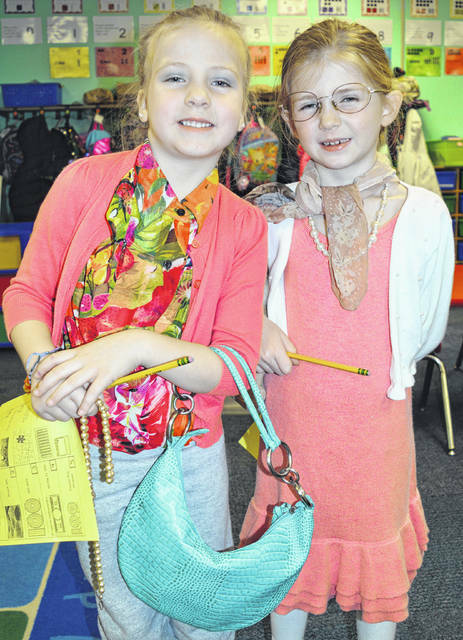 These two “little old ladies” are actually Holmes Elementary kindergartners wearing the type of clothes and accessories their great-great-grandmothers might wear. Tuesday was the 100th day of school for these girls. From left they are Madilyn Puckett and Cecilia Brausch. 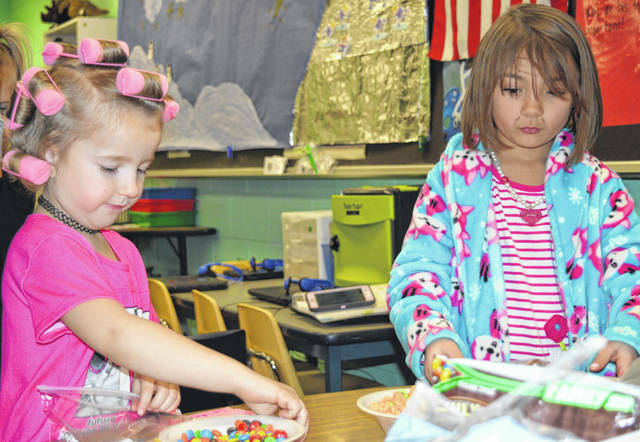 For kindergartners, attaining 100 days of school is a milestone to celebrate. 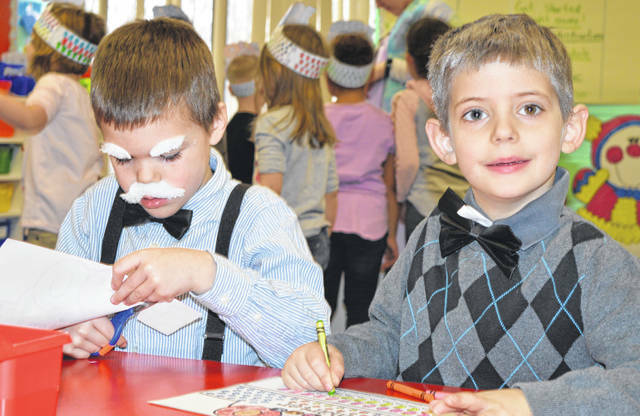 At Holmes Elementary School on Tuesday, some of the kindergarten students wore clothes, or white facial hair, or silver-colored hair on top to make themselves look about as much like a 100-year-old as a 5-year-old can. Seated from left in black bow ties are Jamion Wilson and Griffin Smith whose hair is gray. After observing their 100th day of formal education, the veteran kindergartners got a well-deserved day off Wednesday due to the extreme cold.